Hi, this is Chris Shattuck with build a module dot com. And I'm going to tell you a little bit about hooks, give you an introduction and show you some in action. So first of all, hooks rock. They're the way that developers can tap into the power of Drupal and really use it without building a lot of their own code. 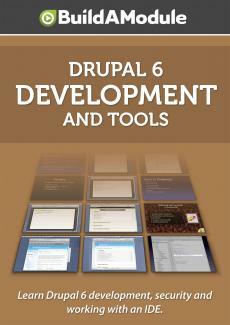 And that you can plug in to different aspects of Drupal to alter things. So some of the things you can do, you can add elements to any forms. So say the user form, you want to add an element that ask people their favorite color, you can do that with a hook. If you want to do something when a user is changed in some way, they are deleted, they're blocked, something like that. You can trigger different actions when that happens, you can do anything at that point. You can add new pages to your site through a hook. You can create new permissions. So if you want to, there are certain areas of the site, certain functionality that you want to expose to just certain users, you can do that by creating your own permissions. You can add your own database tables. So if you want to store in a unique way, that it's not available through the node table or the user table, you can create your own. And there's so much more, there's lots and lots of ways to leverage hooks. So, real quick, a few important bits before I go into a practical example. Hooks are really easy. The code is just a line or two. So when you're thinking about, is it really worth learning the hook system to integrate this new functionality that I have in mind? Yes, it definitely is. You can create a hook so easily and that opens up your module so that other people can extend it. And implementing using hooks that are exposed by other modules is really easy as well. So you just need one example to look at and then it's pretty easy to see how to do it. So it's really easy, don't let the sheer power of the hooks system prevent you from getting started. So when people are talking about hooks they say things like, hook menu or hook form alter, hook node api. And that can be a little deceiving because when you call a hook, you're not calling a function that says hook, that looks like hook menu. So for example, if you're calling a hook, what you're going to use is your module name underscore and then the hook name. So hook menu for example, you would use your module name underscore menu. And that would be calling the hook. So you know, this is kind of a tricky part when you're getting started. People are talking about hook menu, you don't see any functions that are called and you don't see anybody using it. So when you're looking for examples, what you can do is, do a text search through Drupal core for example and look for underscore menu or underscore form underscore alter underscore node api. And that will give you some, if you're looking for examples of hook, that's how you find it because the individual function names are going to be prefixed by a module. So there's tons of hooks out there. So probably the thing and you know the reason why we don't why we don't use them more is because there's so many of them and you can get by with just a few. But there are over 70 hooks and I'll show you the page on api dot drupal dot org where you can see an overview of the hooks, what they do, where you can you find them in the code. And even in these hooks, there are lots of miniature hooks inside the hooks. So for example there's a hook user, right. And inside hook user there are different operations for when a user is deleted, when a user is added, when a user is blocked, those kinds of things. So each individual hook could be several hooks all in one. So when we say there are over 70 hooks but really, there's a lot more to wrap your mind around if you're going to use all of them. But the good things is, you don't usually need to. So one other thing I just want to point out is that, a lot of the things that you can do with the hook system, you can do with the triggers and actions modules. So those come in core 6 and so, for example if you want to do something when a user is deleted, you can do that through triggers and actions. But by using the hook system, it's a toss-up. If you're going to use triggers and actions, your code, the things that you do are going to be in configuration which means it's stuck in the database. Sometimes you don't want to have your code stuck in the database. And this concept will come up a lot when you're developing a module. You'll have to decide between, do I want it in configuration or do I want it in code? And there's good arguments for both, sometimes it's clear to use one or the other and sometimes it's a toss-up. The benefit to having in code is that it's easier to edit. You don't have to use any forms. You can version control it, stuff like that. So it all depends on who's going to be using it, who needs to alter it. So if you have editors, administrators that need to be able to alter the code, alter what happens when triggers occur. Then you'll probably want to expose that in configuration instead of having it buried in code that your site administrators are not going to be familiar with. Okay, let's go ahead and take a look at a practical example. So before I get started with the example, I want to show you real quick where on api dot drupal dot org you can information about hooks. So the page you want to go to is backslash api backslash group backslash hooks.